Sean and I haven’t been out birding together for a long time. The last time was in April when we went to Marine Park looking for a Mew Gull. After he and his wife moved to New Jersey, we’ve really just shared birding experiences over the telephone. Friday we finally worked out our schedules so that we could spend the morning in the field. Sean wanted to try to photograph some Saltmarsh Sharp-tailed Sparrows. He suggested that we try the Oceanside Marine Nature Study Area as it is likely the best opportunity to find one of these colorful birds. Many people associate sparrows with uninteresting “little brown jobs”, but one look at a sharp-tailed sparrow would change that perception. 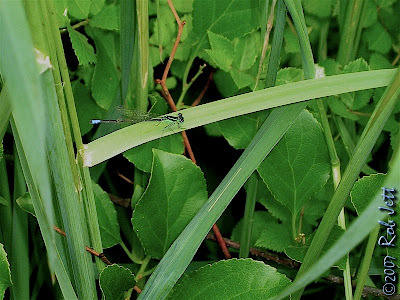 I really enjoy the flora and fauna of marsh habitats, especially the mosquitos and green flies. Actually, I’m usually oblivious to the insects until I’m covered in welts and miserable. Most of the morning was overcast and cool, so the insects weren’t a problem. After a visit to the marsh we planned to head over to Prospect Park where Sean would take some documenting photos of the Acadian Flycatchers. I had never been to the Oceanside marsh and was really impressed with the number and tameness of the birds. 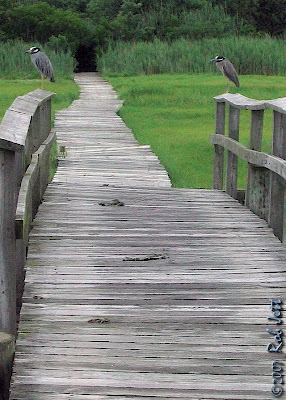 There were Yellow-crowned Night-Herons everywhere that didn’t seem the least bit concerned with our presence along the facility’s boardwalks. Tree Swallows were flying back and forth nonstop, throughout the salt marsh. Several times individuals would fly routes that seemed to pass within inches from my head. Intellectually, I knew that they wouldn’t hit me, yet I still jerked my head out of the way every time. A pair of Ospreys nesting on a platform adjacent to one of the boardwalks were caring for three young hatchlings. Like the herons, they were incredibly tolerant of humans and didn’t react when people walked directly beneath their nest. I watched in awe as one adult arrived with a large fish and patiently pulled off small pieces and gently fed it to each offspring. One my way back to the trailhead I spotted a Clapper Rail bathing on the opposite side of a narrow channel. 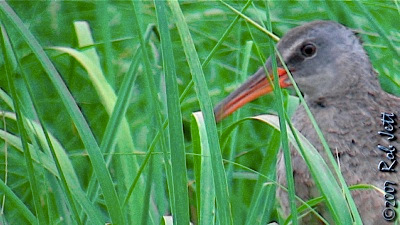 Rails are generally skittish birds that vanish into dense marsh grass at the slightest hint of danger. In this case, though, he ignored me and continued his preening rituals uninterrupted. 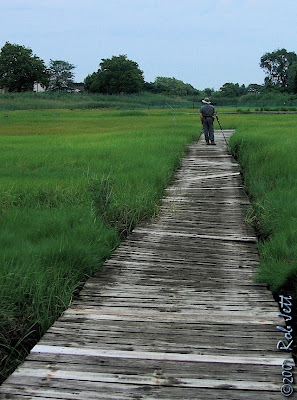 At that point, Sean was at the opposite side of the marsh, sprawled across the wooden boardwalk on his stomach. For most people, that might be a concern, but I just assumed that he was composing a photograph, or drunk (just kidding). 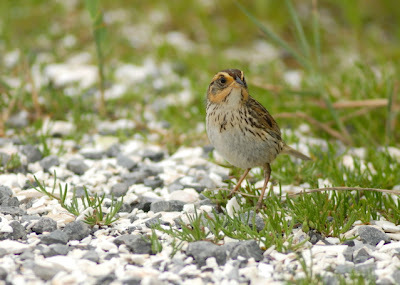 There were several Saltmarsh Sharp-tailed Sparrows in the area. We located a few by their airy, high-pitched version of a Red-winged Blackbird’s song. The sound was an interesting contrast to the deep, guttural “quocks” and “squawks” of the nearby herons and egrets. We were pressed for time so, after a couple of hours, headed into Brooklyn. I lead Sean to the general vicinity of the Acadian Flycatcher nest, but didn’t point it out. We are both ear-birders, and I thought it might be fun to see how long it would take him to find it. Within only a minute or two we heard the first “PEET-sah”. Locating the nest was easy for him. Not much of a challenge. While we were taking photos I heard one of the fledgling Red-tailed Hawks in the distance. He was crying for food again. I walked away from Sean to look for the hawk. I imitated his whistle and he got a bit closer. To my left, a Blue Jay also started imitating the young hawk. It’s curious that a small songbird would mimic a top predator. Wouldn’t it attract the very bird that they would want to avoid? Like Thursday, I never got a clear view of the Red-tailed Hawk, just some moving leaves and branches near the top of a tuliptree. "Airy version of the Red-winged Blackbird's song? That was the Seaside Sparrow. The Sharp-taileds sing "tchk-tsssssssss""
Outside of looking in on the hawks once and a couple of hours of “insect-watching” with Steve, I really haven’t done much exploring around Prospect Park since the City Birding Challenge back in mid-May. Early Wednesday morning I spent a some time birding in the park with my friend, Orrin. I cycled into the park as I had only a couple of hours before I needed to get back and it helps me to cover more ground. It felt good being on my bike in the park. The park’s western roadway begins a long descent towards Prospect Lake near the Bandshell at 9th Street. At around that point I usually change gears for a short burst of speed, then stop pedalling. That begins a 3/4 mile freewheel passed the 15th Street park entrance, the west edge of the Quaker Cemetery, the southern base of Lookout Hill and, finally, the start of Wellhouse Drive at the edge of Prospect Lake. I usually turn onto the drive, but today I continued letting gravity carry me towards West Island for a total distance of nearly 1 mile. It’s not that I’m a lazy cyclist so much as a lazy birder. As I’m coasting along that route I’ll listen for bird songs and calls. On Wednesday morning there was a Chipping Sparrow trilling from the top of a pine tree near 15th Street. Over the last few years they’ve begun nesting in the park. There’s a very healthy stand of pine trees near that location that was planted about 7 years ago. I’ve read that chippies prefer conifers and, prior to the growth of that stand, there weren’t many healthy pines in the park. Farther down the road, near the cemetery, I heard a small flock of Cedar Waxwings whistling as they flew over the road. Near Lookout Hill I’m usually going too fast to hear anything except the air rushing over my ears. I walked my bike to the edge of the lake, to the left of tiny West Island. A mixed flock of some of the park’s resident “handout habituated” Mallards, black ducks and hybrids were sleeping on a log floating near the island. At 7:00AM the temperature was already hovering at about 82 degrees F. There was a mist slowly drifting across the lake and a pinkish haze in the atmosphere that gave the impression of a sultry August morning. I had been staring out over the lake for only a few minutes when Orrin arrived. We didn’t have a planned route and meandered, almost automatically, along the lake’s edge towards Lookout Hill. The removal of several Norway and Sycamore Maples, and planting of numerous native trees, shrubs and wildflowers, has transformed the rise behind lamppost J249 from a sparsely vegetated, eroded hillside into a dense, profusion of green. 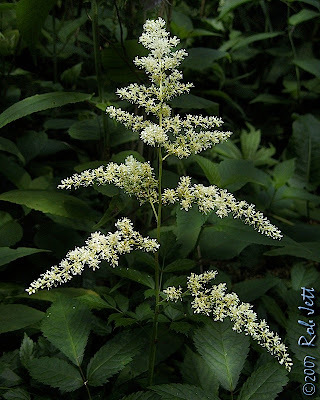 From the base of Lookout Hill, Orrin and I slowly made our way towards the Maryland Monument and zig-zagged along the paths that lead to the Butterfly Meadow at the Hills summit. Along our route we heard or saw several Baltimore Orioles, Red-eyed Vireo, Warbling Vireo and Carolina Wren. I heard the “round-up” chattering call of an adult wren to its young, but was unable to location the precocious fledglings in the dense underbrush. As we approached the Ravine and Nethermead Arches I heard the begging call of a Red-tailed Hawk. It made me smile as I recalled previous year’s fledgling hawks. This is the period of time when the adult red-tails gradually stop providing meals to their offspring. Eventually, the young raptors will let hunger teach them to fend for themselves as they begin hunting. Within the next few weeks, the sad, whistled calls near their nest woods will start to fade. The first call that we heard came from behind the protective fencing on Quaker Ridge. We scanned the trees and underbrush but never found its source. Walking towards the Midwood, I heard the cries of the second fledgling, from the opposite side of the Ravine. We walked up the hill towards the Boulder Bridge looking for the hawk. 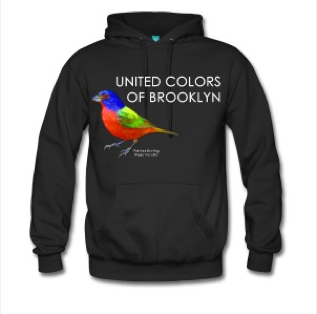 Orrin spotted him as the young bird flew across the ridge and into the Midwood. 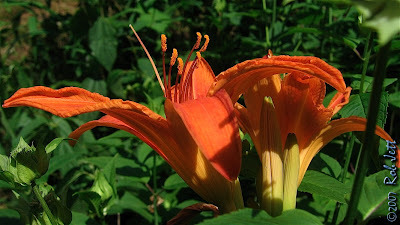 His calls lead us to the base of a towering Tuliptree. Unlike other Red-tailed Hawk nesting territories around the city, Alice and Ralph chose a very natural setting. The huge, mature oaks, maples and tuliptrees in the area make finding the fledglings very difficult. Frequently, I’ll know the exact tree that they are calling from, but cannot see them through the dense foliage. This bird appeared to be very pale-headed, like his father, Ralph. We had several minutes of obscured views then continued on our way. We had been in the park for 2 hours and where heading toward the park’s exit. On our way out I heard a Wood Thrush singing and we began walking towards his sound to look for possible fledglings (and hoping that they wouldn't be Brown-headed Cowbirds). Along the way I heard a bird call that I didn't recognize. It was just a single, sharp note. After about five minutes of looking we spotted an empidonax flycatcher. Shortly after, he accommodated us with a clean, explosive "PEET-sah". It was an Acadian Flycatcher and we watched him for a few minutes as he hawked for insects from between 3 feet and 10 feet above the ground. Then I saw something that I never imagined I'd see in Prospect Park. 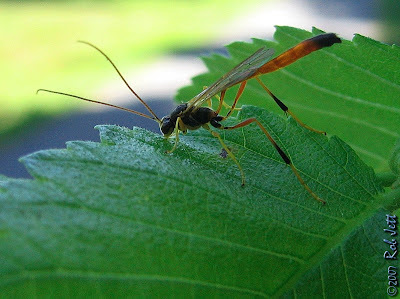 He flew to a branch in a Maple tree ... about six inches above a nest! 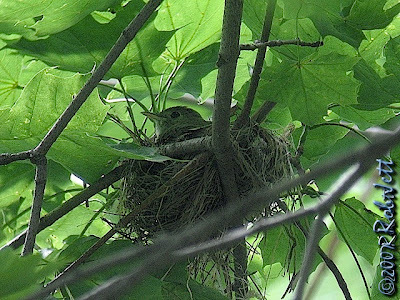 In the nest was another Acadian Flycatcher. They greeted each other, then the (presumably) female left the nest very briefly. She only flew a few feet away where she snatched an insect and returned to the nest. We didn't see any signs of hatchlings but I’ll keep close watch of the nest from a safe distance so that I don’t disturb them. 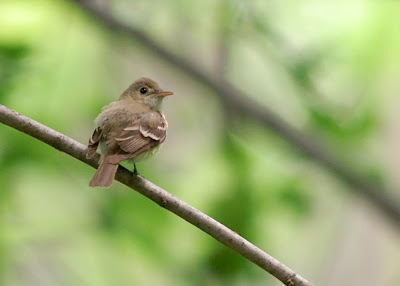 These small, drab flycatchers haven’t nested within New York City’s borders for several decades. I’ve learned that there are some recent indications that they may be trying to reestablish themselves in the city. My wife and I were out of town for a few days. We went down to Maryland, mostly for business, but we had a little down time. Where we stayed, near Annapolis, is a county park called Quiet Waters. I've posted about it in the past. It's mostly a place where people go to run, skate or cycle as there is a very nice system of paths throughout the park. We'll always pay a visit to the park because it's close by, has nice facilities and is scenic. When my wife and brother-in-law going running in the morning, I usually do some exploring along, what is called, "The Compost Demonstration Area". Sounds lovely, doesn't it? It's a short loop that isn't used very often by runners or anyone else, but it's great for wildlife and plants. The path is mostly wooded but creates a small loop where it deadends. There is an opening where the park displays different methods of composting. 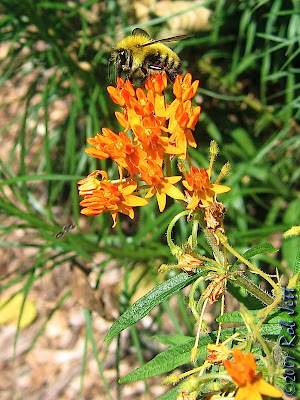 Wildflowers are abundant as are dragonflies, butterflies, bees and other insects. 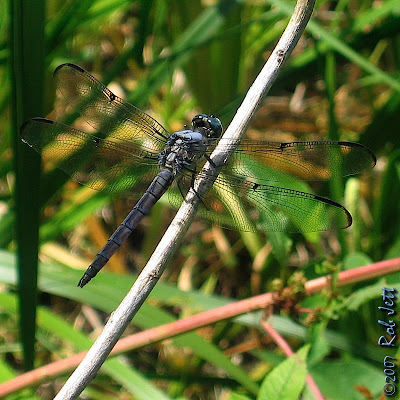 One corner of the loop is a small swamp that's probably manmade, but it works well as there were dozens of dragonflies present. 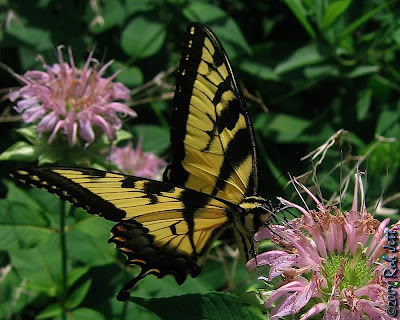 A large thicket of wild bergamot had attracted Tiger Swallowtails and several other, much faster, butterflies. 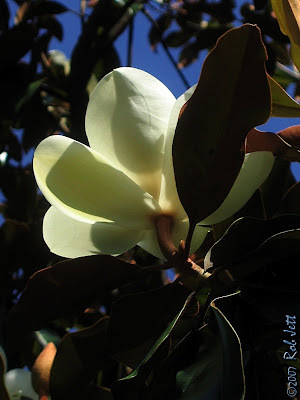 Near the parking lot were several blooming Southern Magnolias. Being from New York it's an unfamiliar tree to me. Most of the magnolias around New York City are non-native "Japanese" magnolias. I usually go to Annapolis earlier and later in the year, so I haven't seen them bloom before this trip. 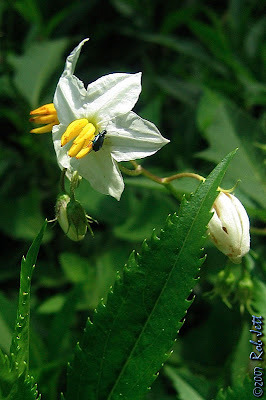 Some of the lower flowers that I examined had an odd, elongated type of insect on the petals. It took a bit of research, but they turned out to be in the longhorn family of beetles. 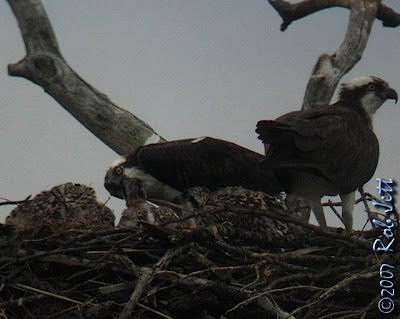 Ospreys seemed to still be multiplying around the rivers that lead into the Chesapeake Bay. If you own a dock along your shoreline, or even rent a mooring, if an Osprey decides to build a nest on it...let's just say you'll be using another dock for a few weeks. And their nests are huge. I would imagine that, after the breeding season, they'd weigh several hundred pounds. While we were away, I missed one day of the Ridgewood Reservoir survey. 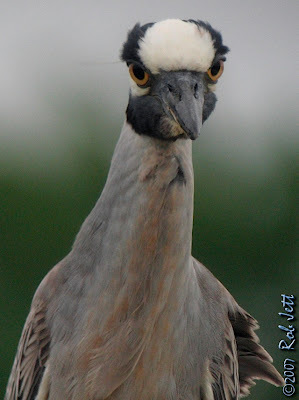 I came back to a bird photo in my inbox sent to me by Steve. It was unlabelled but I had a good idea of the identity and was very excited. I wrote back with my guess. "It IS a Redstart fledgling! We actually saw the father come in and feed it!!!!!!!!!!! Amazing! Also, we had a Yellow Warbler fledgling following one of its parents around so that also confirms Yellow Warblers nesting at the reservoir! [...] We also confirmed Cedar Waxwing. We found a nest with a parent bird coming out." Despite missing the discovery, I'm really happy that we're finding such an abundance of breeding birds at the reservoir. Now we just have to convince the city not to come in with chainsaws and level the place. 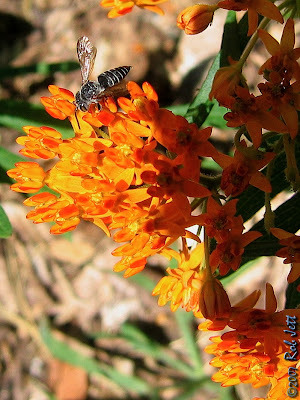 I just found another good source for insect photographs. The name of the website is Whispers in Nature. The site is primarily just images, but they are really nice, plus they have websites for other families of animals. What's That Bug? is more useful in that they cover a huge array of species. I sometimes get sucked up into subject unexpectedly and spend an inordinate amount of time studying it. While looking through the beetles on What's That Bug? I came across an insect that didn't look real, but more like something Timothy Leary hallucinated. 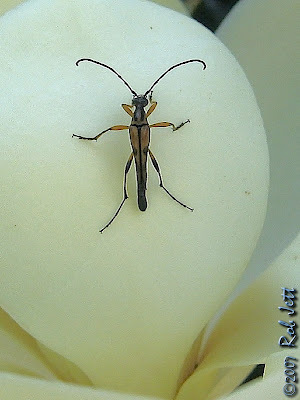 It's called the Locust Borer. Check out these images. 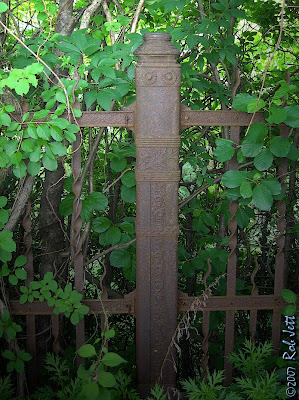 Click here for a list of my postings that relate to the Ridgewood Reservoir survey. 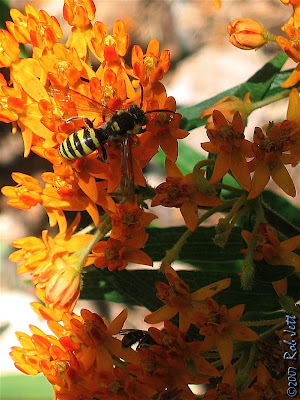 When I started this weblog in 2004 I made the decision to adhere to a nature journal format. My desire was to avoid any type of political topics or agenda. The simple act of observing our urban environment should be free of any myopic bias. Each of my 6 Saturday morning surveys at the Ridgewood Reservoir have had the same level of excitement and anticipation as that of opening a Christmas present. It hasn't just been a new place to explore, so much as a habitat unlike any I've experienced within New York City. Recent news releases describing the city's intent to develop this gem caused me to rethink my rules, at least for this one case. Last night I attended what was billed as "Community Listening Sessions Regarding Future Plans for the Ridgewood Reservoirs". It was hosted by the Department of Parks and Recreation. Heidi and I signed up for the meeting assuming that it would be a group of people listening to the parks department describe what they had in store for the reservoir and its surroundings. What transpired was, well, different. The response by the public to the meeting was a pleasant surprise. It should be pointed out that the image with the 1/2 mile radius of current recreational areas was inaccurate. It showed far less than actually exists. To see a map of any type of recreational areas near the reservoir Oasis NYC has a great mapping system. Each table had an assigned "facilitator". Park administrator, Debbie Kuha, was the person organizing the process at my table, the "Red Team". People who signed up for the event were randomly assigned a color. Heidi and I ended up at separate tables, but Al Ott and I were at a table together. Also present at our table was Tom Dowd, president of the Ridgewood Homeowner's Association and District Director Tony Forman (representing the office of Congressman Ed Towns). There was one other gentleman at our table, but I can't remember his name (some of the name badges were difficult to read). I thought someone said that he represented the office of New York State Senator Serphin R. Maltese. If I am incorrect, I apologize. Mark Morrison, the president of the company who "won the design competition" looked over our shoulders and participated in the discussion for about 10 minutes. It struck me as a little odd that the department of parks would have already chosen a company to design a facility for a project that was still taking input from the community. The city, allegedly, hadn't even made any decision on the reservoir's future. A brief introduction about the project was given by Queens Commissioner Dorothy Lewandowski. She described an elaborate project that was "on the fast track" to breaking ground. Unfortunately, she had to leave for another event and turned over the podium to Kim Fallon of capital projects. To make a long story as short as possible, we were advised that $50 million had been allocated for the development of an active sports facility at the reservoir. The people who signed up for the meeting were divided into 5 teams and were being asked to design, what we thought, would be an appropriate facility. Kim encouraged us to "think outside the box". From the onset of our team's "brainstorming" session, it seemed like Ms. Kua was more interested in placing the activities cut-outs into the basin areas on the map, than listening to our concerns. Tom Dowd began by expressing his opinion that the nature of the area should be protected. Both Al and I agreed, but I thought that a school for Urban Conservation and Research should be built at the edge of the reservoir. I think that it is a unique opportunity to create a one-of-a-kind learning institution. My gut feeling was that our facilitator wanted us to feel obligated to use the carefully constructed cardboard cut-outs to fill up the space within the basins. Here is a brief summary of each team's presentation at the end of the brainstorming session. They decided not to use any of the active facility icons as there are "already plenty in the surrounding area". Their focus was on passive recreation, a nature center and highlighting some of the areas rich history. The existing running path around the perimeter should be widened and small exercise areas added along the route. This team began by stating that whatever activities occur in one basin will affect the nature in the others. They continued with the notion that sports and nature are competing concepts. It was the second team to propose the construction of a nature center. For sports activities they suggested a skateboard area as there aren't any in the surrounding neighborhoods. Half of Basin 3 would be left untouched and Basins 1 & 2 completely untouched. Given the history of the area they also suggested that a waterworks museum be created. For the third time a group began their presentation by agreeing that it should be left as unspoiled as possible. There should be a nature center, possibly elevated walkways above the basins so people can observe the wildlife from above the canopy. Nothing should be filled in. The old pumps should be restored and a small cafe added in one of the old buildings. If there is any development it should be in Basin 1. They made it very clear that they wanted the nature preserved. No longer a surprise, this team began their presentation by stating that the nature of the area was very important. Three out of their six members thought it should not be developed at all. They didn't think that extra parking should be created. If anything, they should expand the existing lot. Because of their concern for the existing natural habitat they recommended that nothing be done without a comprehensive study of each basin. There should be an expansion of the existing green-way into the area and a visitors center built. The old pump house should be restored as an environmental center. 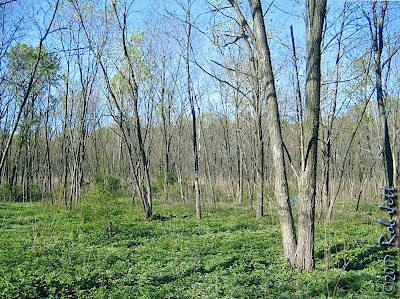 Invasive plant species should be removed and monitored with a nursery created to grow plants that would replace the invasives. The final team was ours, the Red Team. Our presenter, who was chosen by the facilitator, was Tom Dowd. At the start of the discussions Tom surprised Al and myself by talking about the importance of the area's nature and history, although he did have a desire to see an indoor swimming installed in part of Basin 3 ("there are only 11 throughout the city"). He seemed a bit nervous during his presentation and who wouldn't have been, I couldn't have stood up in front of that audience. Through no fault of his own, he basically just read down a list of items that were suggested, primarily, by the facilitator. Towards the end of his speech he remembered all of the conservation points and quickly read through a few. As the last presenters, the Red Team didn't have the rousing conclusion that would have had a big impact. But, ultimately, it wasn't a problem, because Al decided to address the room from his chair at our table. He spoke about the special qualities of the existing habitat and the common misconception that preserving green spaces is an "us versus the birds" argument. To paraphrase his much more eloquent discourse, "Nature isn't just here for the birds, it's also here for people." Al is a big man with a commanding voice. While he was talking I looked around the room at the expressions on people's faces. He projected a powerful tone of conviction and honesty that held the room's attention. His opinion was so well received that the room spontaneously broke out in applause. I was very pessimistic going into the meeting. In politics, despite appearances, sometimes the outcome is preordained. In fact, I found out after the meeting, that there were two parks department employees on one of the teams who were pushing for development. My feeling was that the city would destroy the reservoir's habitats, no matter what happened at any public meetings. Tonight I realized there were more voices speaking for about the intrinsic value of natural habitats than I ever expected. The Department of Parks and Recreation wants to create a world class destination in Ridgewood, what they don't realize is that it already exists. 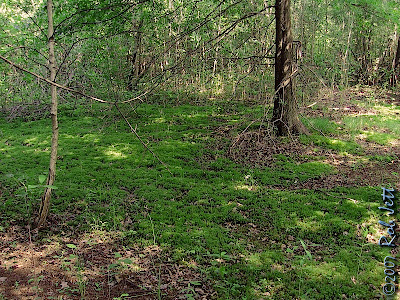 Exploiting its developing habitats as a sanctuary, for both man and animal, and as a teaching facility would bring far more to the entire city than a few sports fields. The Ridgewood Reservoir has 75,000 new "residents"
Before I get to my post on the Ridgewood Reservoir, I’d like to give a little recognition to a deserving local organization. Bobby, the wildlife rehabilitator who rescued “Ziggy” after the red-tail’s unsuccessful first flight, probably goes unrecognized most of the time for the service he performs for injured animals. The Daily News has a follow-up article regarding the rescued hawk. A mention is the least I can do for a guy who spends his days saving humans and his leisure time saving animals. During one of my first visits to the reservoir I met a man named Angel. He had come by bicycle and was just soaking in his surroundings and a little bit of sun. We began talking and it sounded like he used the reservoir as his sanctuary away from the surrounding city. 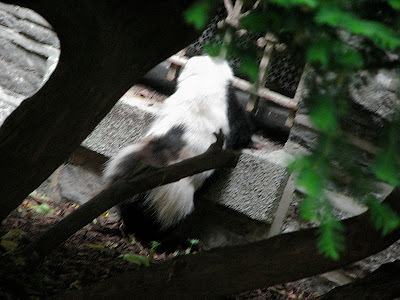 I asked him about some of his observations over the years and he mentioned some of the expected urban creatures, such as, raccoon and opossum. Then he said, “In the summer there are lizards all over the place.” I thought that maybe he was exaggerating, that maybe once somebody’s pet iguanas escaped into the area. However, iguanas would never survive a typical New York City winter. Angel went on to explain that, once the warm weather arrives, the small reptiles emerge from the openings in the ends of certain pipes. Steve and I looked at each other and thought that maybe this guy was “on the pipe.” At home that night I researched northeastern reptiles but didn’t find anything that I thought would be flourishing in Queens or, for that matter, anywhere in the 5 boroughs. On Saturday Al Ott and his wife, Karen, joined us for our morning inspection at the reservoir. Al has been very active in the NYC conservation community for many years. He was the driving force that prevented a bike path from being paved through the Jamaica Bay Wildlife Refuge. As we walked along the outer edge of the three impoundments I mentioned to Al the story about the lizards. He said that there was a small population of a european species of reptile on Long Island. They appear to be an innocuous presence in the limited pockets that they inhabit in New York, so ecologists have left them alone. It was shortly after that conversation that Steve caught a small lizard in a discarded plastic bottle and brought it over to show us. It was the same species as the one on Long Island, the Italian Wall Lizard. 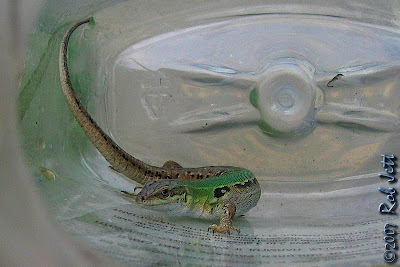 I was able to take some photos through the neck of the bottle, but when I put it on the ground for Steve to photograph, that 4 inch green lizard moved faster than a cheetah on steroids. It vanished into the underbrush before Steve was able to press down on his shutter release. "The most likely story involves a 1967 shipment destined for a now-defunct pet supply store that was waylaid by a minor accident, a broken crate and some very swift escapees." I found this explanation to be the type of myth that could never be proven one way or the other. I find it amusing that nearly the exact same folklore has been adapted for the flocks of Monk Parakeets that have colonies in various corners of Brooklyn. It sounds like 1967 was a year of animal conspiracies. They also have an interactive map that illustrates the expanding range through the borough of Queens. So, Brooklyn has their Monk Parakeets and now Queens has their Italian Wall Lizards. Sometimes I feel like as I’ve aged, time has become more compressed. Everything seems to occur much faster; seasons change, children grow, hawks fledge and weeks feel like days. This spring it seems like I’ve missed out on some of the annual changes. 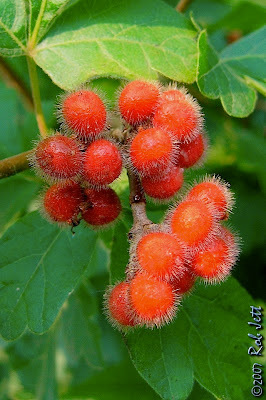 When I saw ripe mulberries in Green-Wood Cemetery last week, I thought to myself, “How can the trees already be fruiting when it’s only; oh yeah, it’s nearly July”. Maybe I'm just trying to experience too much at one time. At the Ridgewood Reservoir, plants that were flowering on my previous visit, were now either covered with young, green berries or already giving up their ripened fruit to the birds. 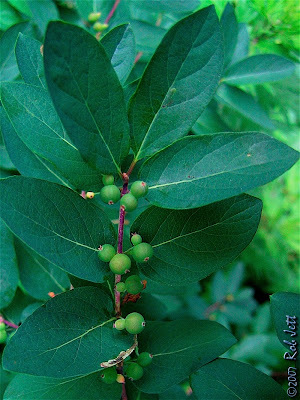 Like most of urban America, there are several species of honeysuckle proliferating around the reservoir habitats. 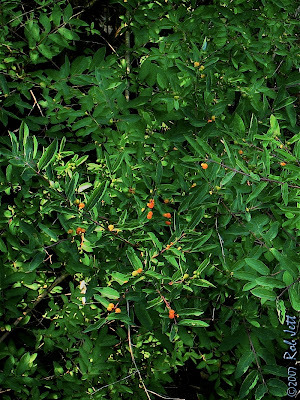 One species that I’ve never noticed before was the Tartan Honeysuckle, which are new covered with vivid orange berries. 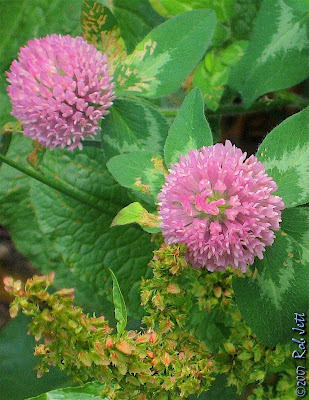 Flowering Sweetbrier was providing nectar for bees as was the large blooms of the Red Clover. In grassy sections on the outer edges of the running path wild garlic has dropped its petals and were ready for harvesting. In addition to hundreds of dragonflies and damselflies (most of which I cannot identify yet), we noticed an abundance of ladybug pupae and larvae. They will be emerging just in time to feed on the aphids that feed off of the plants. I’ve learned that the stretch of green space that runs through Queens from Forest Park to the reservoir is a part of the terminal moraine that also includes Prospect Park and Green-Wood Cemetery. 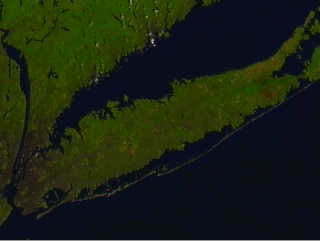 The following computer animation of a fly-by from above Long Island and up the Hudson River is on Nasa’s “Visible Earth” website. If you watch closely on the right side of the movie, you’ll see how the elevated terrain of the Ridgewood Reservoir, Green-Wood Cemetery and Prospect Park all align with the ridge on the north shore of Long Island and continues down, through Staten Island. I’ve noted in the past that the hilltop above the reservoir is ringed with mature Eastern Cottonwoods and on Saturday the wind was scattering a snow flurry of their fuzzy seeds. 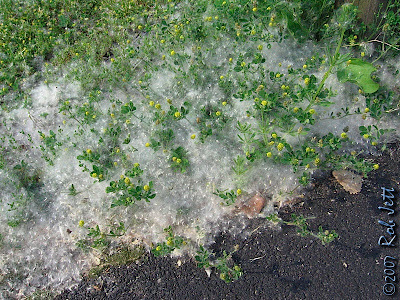 Drifts of goose down-like fluff was piling up along the edges of the running path. 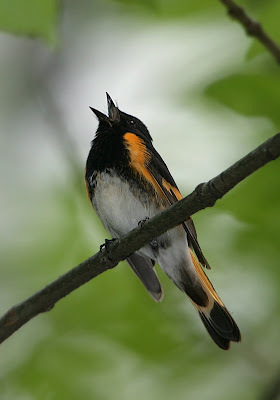 In addition to the Yellow Warblers and Common Yellowthroats that we had noted earlier in the spring, there were still American Redstarts present around the borders of the reservoir. I’m not certain if that means that they are breeding, but it is a positive sign. 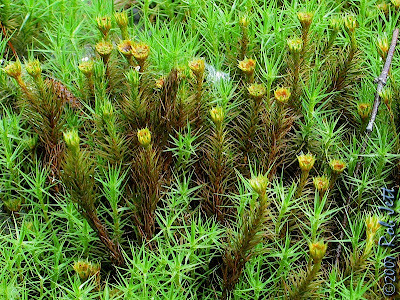 Inside the bog-like basin mosses are proliferating. I’ve been told that it is a good indication of the habitat’s health. 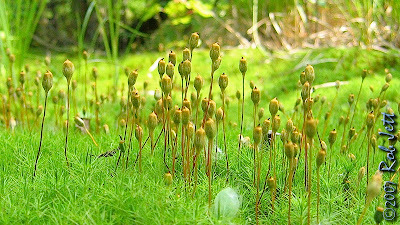 I noticed that some of the species of moss were in a stage that could be compared to flowering. 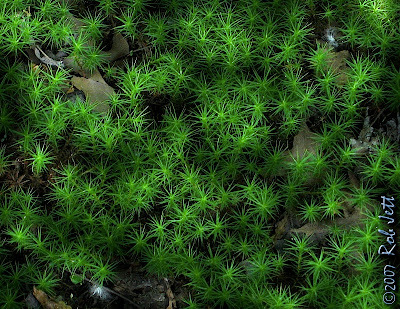 With my face against the cool, green carpet of moss I shot some photos of the tendril-like filaments preparing to release their spores. In the same impoundment I found a cluster of wild irises in bloom. 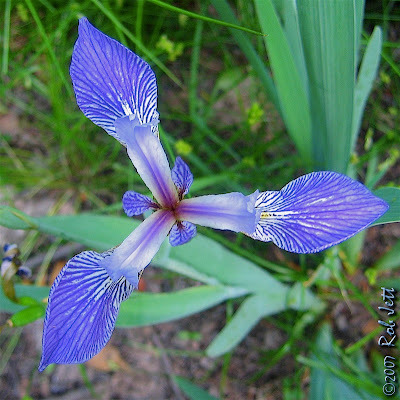 I don’t think that I’ve ever seen native irises in New York State, just the engineered varieties that people plant around their lawns or florists deliver in cut flower arrangements. I won’t be able to participate in the next scheduled survey as I will be out of town, but I will be going back on July 14th. The Ridgewood Reservoir and it’s surrounding habitats are an incredible piece of nature in the most densely populated and developed city in the United States. In fact, I’m amazed that it has managed to escape bulldozers and backhoes for so long. Unfortunately, that may be changing. The mayor has proposed that at least on basin be turned into a recreational facility (i.e.. soccer stadium, baseball fields) while the others "turned into" a nature preserve. I never feel good about it when words like “turn it into a nature preserve” are used to describe a habitat that has already evolved into one, without the help of designers. I’ll be attending the first meeting tomorrow. 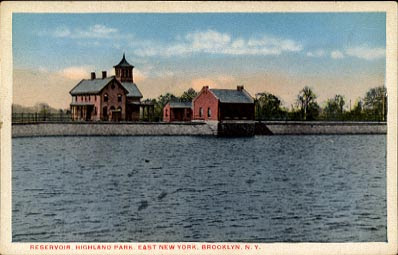 I'll post some links later tonight that are relevant to the Ridgewood Reservoir. Below is our species list from June 9th, followed by the cumulative list of species. In 30 hours of surveying the reservoir habitats we have tallied 101 species of birds. Here's a final word from Chris regarding the Fordham triplets. That's followed by the latest from the 888 7th Avenue fledgling. 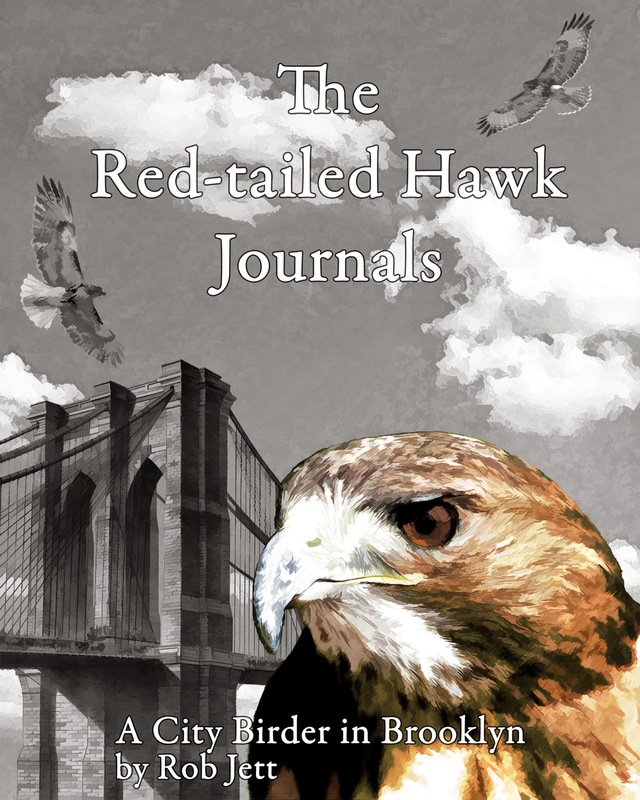 I will never neglect the city's Red-tailed Hawks in my observations and journal writing, however, from this point foward I will spend more time on other nature observations. The hawks will inevitably end up somewhere in the big picture as a result of their position at the top of the food chain. Plus, they're just such amazing animals. Later today, I'll have a post and images from my most recent survey at the Ridgewood Reservoir in Queens. 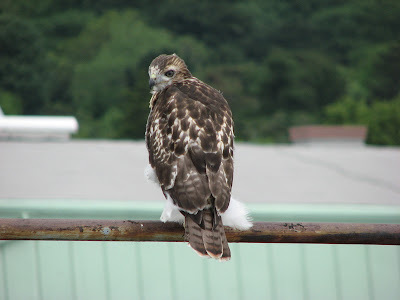 We got up to the roof of Dealy Hall, and there was a fledged Red-Tail, perched on the railing. And I didn't have my camera ready. Naturally. So we hugged the wall, scrambled to get our equipment out, and quietly implored the young hawk to stay put a few minutes, and he or she graciously obliged. For a few minutes. Then flew over to Hughes Hall, to join a sibling who was already there. 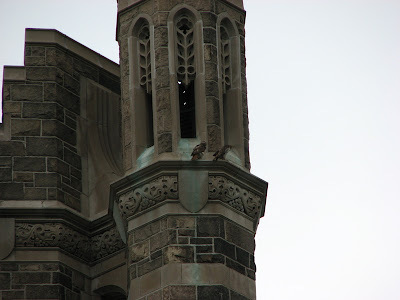 Then Yolanda spotted a third browntail, over on Loyola Hall. This marks the first time I've seen all three outside of the nest at one time. Here's the second installment on the plight of the Midtown fledgling from the New York Daily News. The fallen baby hawk rescued in Manhattan was nursed back to health yesterday with the help of a surrogate mama - and he may be ready for release soon. "He's stretching, he's exercising his wings. He's doing everything he should be doing," said licensed wildlife rehabilitator Bobby Horvath, 44, who has been caring for the red-tailed hawk, dubbed Ziggy by a reader at NYDailyNews.com, at his Long Island home. The 7-week-old fledgling was grounded Wednesday after losing control during his first flight and plunging into a courtyard near the Ziegfeld Theater on W. 55th St. Yesterday, Ziggy took a step closer to a return to the urban wild. 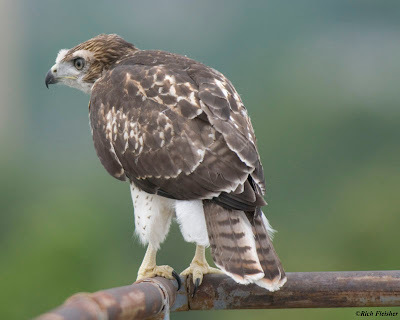 After spending the night resting in Horvath's home, the brown, white-speckled hawk migrated in the morning to the backyard, where Horvath keeps a 25-by-12-foot flight cage. It's 9 feet tall. The hawk immediately befriended the cage's other resident: a permanently flightless red-tailed hawk named Diana. "He went right up to her," Horvath said. Ziggy let out a piercing scream - hawk baby talk for, "I'm hungry." The 10-year-old mama hawk, who was shot in the wing at age 3, went to work. Using her beak, Diana fed the youngster a breakfast of chopped rodent. Then she sat beside him on a wooden branch, feathers puffed in a sign of maternal protectiveness. Still, Horvath worried about the hawk's recovery time. There's only a narrow window for returning missing hawk chicks to their nest. By the end of the day yesterday, the baby still hadn't taken a full flight. "We want to get it back, but we don't want to rush it just to satisfy people who want to get it back in the wild," Horvath said. Meanwhile, city birders anxiously awaited Ziggy's return. 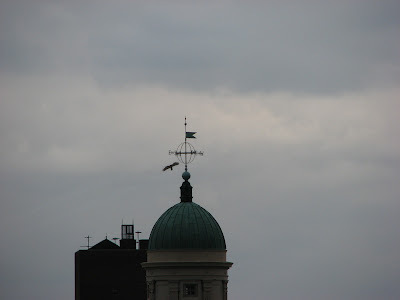 Accountant Brett Odom has been monitoring what he believes is the hawk's nest from his midtown office window since the parent hawks arrived there this spring. 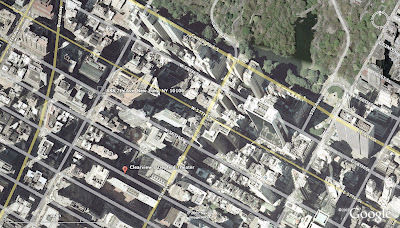 Since the fledgling went missing from the nest on the 36th floor of 888 Seventh Ave., Odom has watched the mother hawk waiting in the now-empty nest and searching the area. "I hope he comes back soon," said Odom, 36, of Chelsea. "She's probably wondering where he is." There was a story in the "Daily News" about an "injured" hawk found near the Ziegfeld Theater. When I looked at the locations on a Google map, it seemed clear that he was the fledgling from the nest on 888 7th Avenue. All the people helping meant well, but if there's nothing wrong with the young hawk (which I suspect), taking him away to Long Island will cause undue stress on both him and his parents. They should have walked a few blocks to Central Park and released him. A downy red-tailed hawk plunged from the sky after leaving its nest for the first time yesterday. Urban Park Rangers director Sara Hobel holds the rescued fledging after it was found on a courtyard near the famed Ziegfeld Theater on W. 55th St. The bird was taken to a sanctuary on Long Island. For a downy red-tailed hawk that plunged from the sky after leaving its nest for the first time yesterday, it took practically an army. Nine cops, three city Parks Department rangers, a volunteer from the Audubon Society, a licensed hawk rehabilitator, a half-dozen good Samaritans, a homeless man, a gaggle of paparazzi and 50 gawkers converged at a midtown courtyard after the brown-and-white speckled bird touched down. "People were taking pictures of it like it was Angelina Jolie," said Chris Ferretti, who was walking his dogs when he spotted the bird huddled against the back wall of the famed Ziegfeld Theater on W. 55th St. 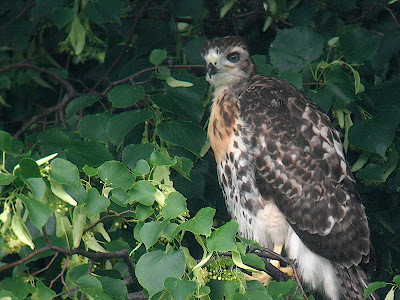 The only-in-New-York saga began around 8 a.m. yesterday, when several people saw the dazed hawk struggling to fly away. The bird seemed desperate to get off the ground. Natural predators were everywhere. Moments later, a homeless man picked up the bird and tried to run away with it. But he didn't get far. "There was an angry mob and we were like, 'Where you going with that bird?'" said Ferretti, 44. The vagrant placed the hawk back on the pavement and slipped away. Over the next 90 minutes, concerned onlookers called Animal Care and Control, the Bronx Zoo, the city Parks Department, the Audubon Society and anyone else they could think of to come rescue the hawk. "I never thought it would be so hard to get anyone to help," said Dora Amerio, 34, an accountant from Astoria. Finally, about 10 a.m., three cops from the Midtown North Precinct blocked off the courtyard to keep pedestrians away from the bird. Soon after, the NYPD's elite Emergency Service Unit truck rolled up. Almost simultaneously, a volunteer from the Audubon Society, a freelance licensed bird rehabilitator from upstate New York and three uniformed members of the Parks Department's Urban Park Rangers arrived. 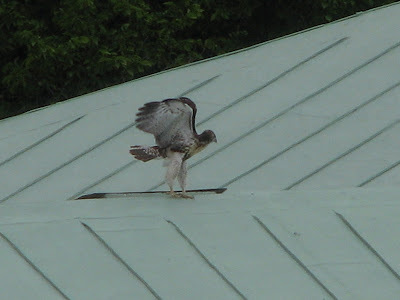 Another hawk, perhaps the chick's mother or father, was seen circling high above the courtyard. But Sara Hobel, the director of the Urban Park Rangers, said the older hawk did not dive down to feed the baby because it was surrounded by so many people. All of them wanted to rescue the little bird. "It's like it's a custody fight," said Sarah Iams, the Audubon society volunteer who is trained to rescue injured wild birds. Iams added, "The largest thing I've ever saved is a sea gull." The would-be rescuers conferred and the Parks Department won out. Rangers covered the bird in a blanket and whisked it away to their E. 105th St. headquarters to check for injuries — but found none. 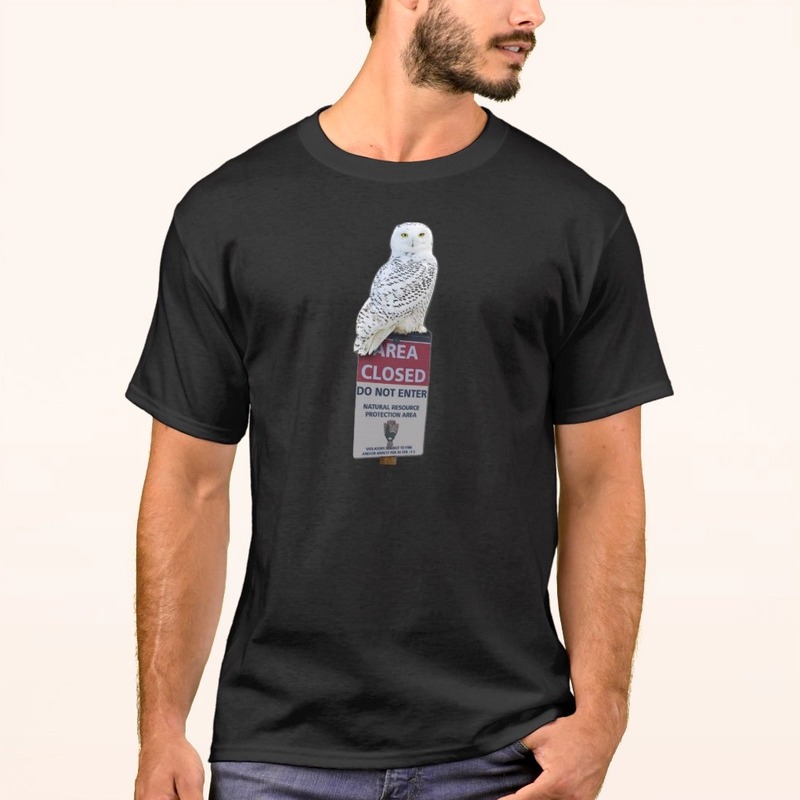 The bird is not related to the city's most famous red-tailed hawks, Pale Male and Lola, who won the hearts of New Yorkers by making their nest atop a Fifth Ave. co-op. 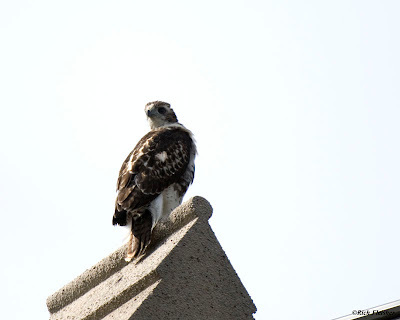 Hobel said she traced yesterday's hawk to a nest near Central Park South and Seventh Ave. Bird watchers had spotted the hawk taking its maiden flight from the nest some time late Tuesday, Hobel said. With the overnight storm, it's likely the hawk got disoriented and crashed into a building and then fell to the ground. Its weak flight skills kept it trapped in the courtyard, Hobel said. Many fledglings falter during the first flight, she explained. Typically, the hawk parents will fly down to their chicks and feed them until they get their strength back up and can fly again. If the baby bird hadn't been rescued, it probably would have died of dehydration or injury, Hobel said. 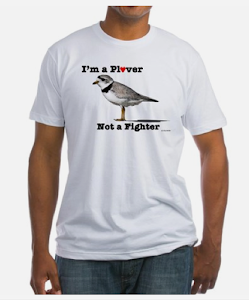 Only about 15% to 25% of fledglings survive their first year. But this hawk's going to be fine, rescuers said. 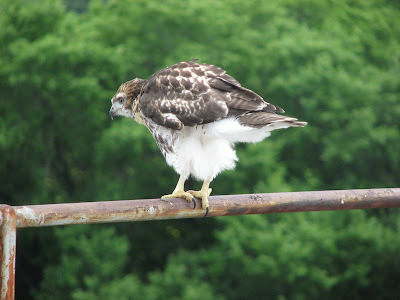 By 2 p.m., the hawk was on its way to a trusted rehabilitator on Long Island. When it's rehydrated and ready to fly, the bird will be brought back to the city and released, hopefully within the next few days, near Central Park South. "He will find his way back to his nest," Hobel predicted. "The most important thing for us it to educate people that we're the right people to call." This note from Christopher was in my inbox this morning. 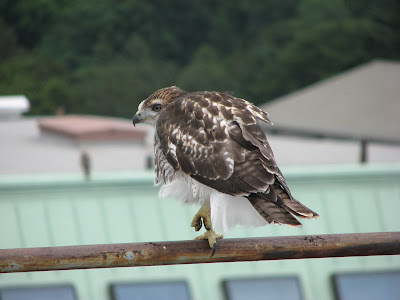 To date, I'm not aware of anybody observing any Red-Tail fledgings at Fordham in 2007 (I was lucky enough to see one in 2006), and at this point, it doesn't seem likely that anyone will--all three have fledged, but it's hard to estimate when the third one went, because early this afternoon, two young Red-Tails were seen resting inside the pediment on Collins Hall--at least one of the kids had come home to roost. Therefore, I was either looking at one fledged and one unfledged bird--or two fledges. Around the same time, Hawkeye and Rose were once again surveying their territory from the Neogothic spires of Keating Hall (built in 1936, but it does look awfully medieval). Rose was later seen perched inside the globe-shaped weathervane on top of Theodore Roosevelt High School, just outside the campus, which I like to refer to as 'The Sphere of Influence'. She kept returning to this spot, and I eventually caught her swooping in. When I checked back in the evening, things had changed quite a bit. I believe I saw all three fledglings, but not at the same time. One was on top of Collins Hall, one on nearby Loyola Hall, and one on Hughes Hall--they are definitely making the rounds. 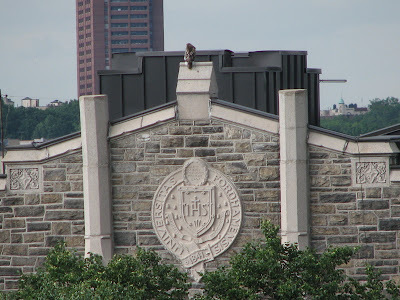 The final picture is of a fledgling on Loyola Hall--right over an architectural cartouche representing the Great Seal of Fordham. The stylized IHS stands for Jesus' initials in Latin, and emblazoned upon the shield is the university motto--'Sapientia et Doctrina'--Wisdom and Knowledge. No mention of instinct, but it's not a university's job to teach that. And there are all kinds of wisdom. Things seem to be working with my blog template, so I have a couple of notes then a hawk update. 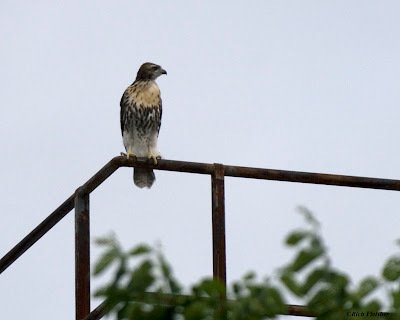 I spent some time thinking about my experience watching the juvenile hawks, as well as, e-mailing a few people for their opinions. I now realize that it was wishful thinking, not rational thinking that lead me to the mistaken notion that the two hawks were the fledglings from the Ravine nest. For one thing, they were just too good at hunting. I would say that he's last year's offspring from the color of his cere, legs, eyes, and the mostly white wash of the chest area. Anything hatched this season would still have some blotching left on the chest at this early part of the year and the cere would appear greener and the legs would be more yellow, as opposed to a paler yellow. I have the same opinion on another bird theres pictures of a few weeks ago on your site described as a young bird from McCarren Park. It too would be a second year bird in my opinion. [...] It's tough telling from just the tail. The eye color transitions from 1st year to second to early adult to late adult. I've had 3rd year birds half red half brown tail and their eye color is split evenly from light brown to dark brow. Both hatch and second year birds have the brown tail just the the hatch years would appear a bit darker if you saw the 2 side by side for comparison. 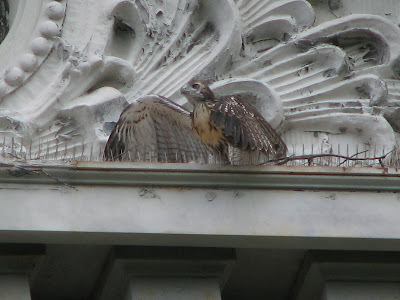 I left the campus today for an appointment elsewhere, knowing that both Lincoln Karim and Rich Fleisher were staking out Collins Hall, hoping to catch the third fledging (the first two having happened without any human witnesses we know of). 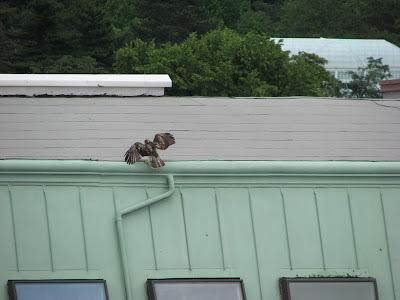 Earlier that day, trying to find out where the two fledged birds were, I came across a Striped Skunk, scurrying along the edge of Loyola Hall (the roof of which happens to be where Donegal Browne and I spotted the first fledge on Monday). Aside from a somewhat scraggly tail, he seemed perfectly healthy, and not particularly eager to spray anyone with his distinctive cologne. 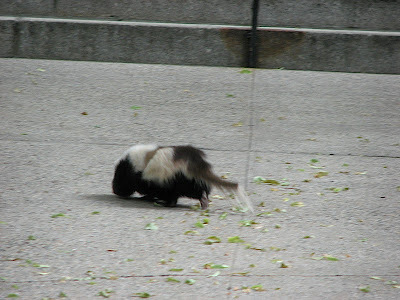 I had always figured we had a few skunks, but this was the first time I'd seen one at Fordham (well, I saw G. Gordon Liddy once, but that's a whole other story, and why malign NYC's only representative of the weasel family with such invidious comparisons?). He seemed to be checking the ground under the bushes for insects and such, casting an occasional wary glance in my direction, and making it hard for me to get a good picture. I doubt the hawks will bother him, and he's certainly no threat to them. But some other human denizens of the campus seemed a bit alarmed when they saw him. Perhaps Pepe will revert to nocturnal habits in future. No question, the fledges from Collins have happened earlier than the fledges from the tree nest they used in 2005. And for some reason, the fledglings this year are taking a lot less time to put some distance between themselves and their former nursery. What I don't know is why. But then again, I hardly ever do. As of today, Tuesday, two of the eyases have successfully fledged. Not only have they fledged but they are not at all cautious in trying out their new found skill. 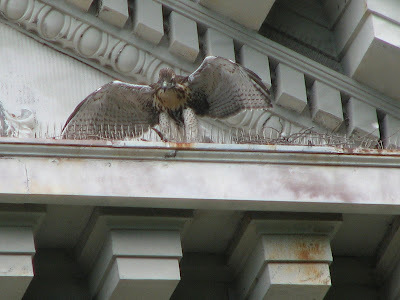 They could be spotted on top of several different buildings around campus that are not proximate to the nest building. Very different from last year, when the first week of fledging consisted of flying to the trees nearby Collins Hall (where the nest is located). I suspect that the third, who spent much of today whining each time one of the other Hawks flew by will be fledging very soon (Wednesday or Thursday). 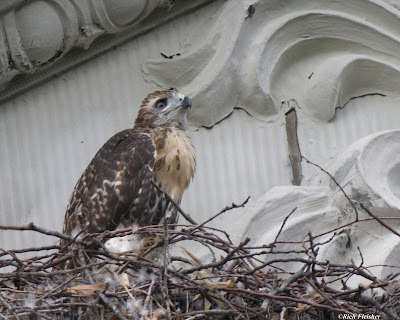 Finally, in Green-Wood Cemetery, Marge has been watching the two fledglings make regular flights, including back to the nest. With Junior providing a constant stream of food, they’ve become total slackers, returning to the nest for handouts. Since her first nest in 2002, Big Mama has raised 5 broods (“Baby Huey”, the single hatchling from last year, was so large that I think he qualifies as a brood). 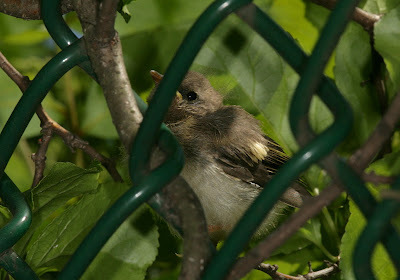 This is the first time that I’ve seen fledglings returning to the nest. It is possible that the parent could have a strategy. Unlike other locations, the nest is located in a section of the cemetery where trees are pretty spread out. Their flights to the closest trees from the nest average between 55 and 75 yards. Beyond that perimeter the tree cover is more dense. By bringing the food to the nest, it does force them to fly a fair distance. Maybe over the next few days, once he thinks they are ready, the food enticements will get farther from the nest and into the “forest”.